Hard to believe October 1st has arrived! the swing of things with school now in session. Come be a food warrior! The New England Common Assessment Program (NECAP) is the yearly standardized assessment Vermont gives all middle school students. These assessments are designed to evaluate both individual student achievement and Hunt's annual yearly progress (AYP). All students will be testing October 9th through October 11th in reading and math, while only 8th grade students will test October 12th in writing. Please encourage your kids to get a good night sleep, eat a good breakfast and RELAX before test taking. Let’s bring together all of our students, staff and their families to share and celebrate the fresh, local, seasonal food we strive to include in our healthy school lunches. Our menu will include homemade recipes, classic favorites and a bountiful salad bar. Please contact: Jennifer Tomczak at 865-2792 or jatomczak1@gmail.com if you can help. 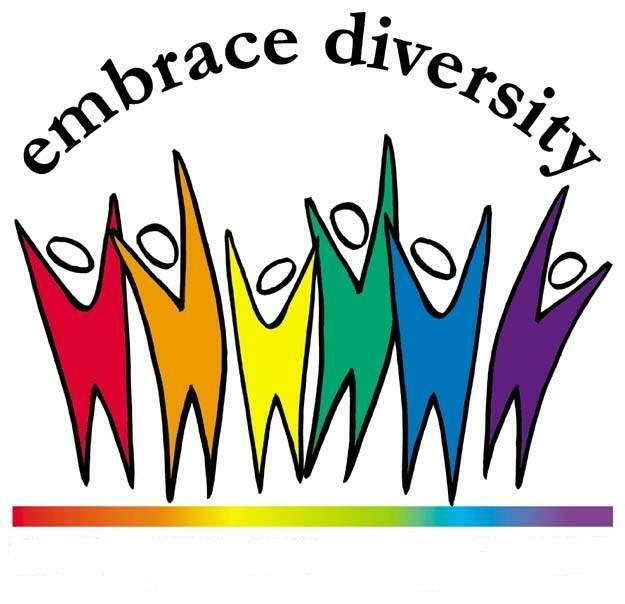 The Diversity and Equity Committee of the Board has been working this fall on a strategic vision for diversity and equity within the District. This work will be brought to the full Board for approval at the October Board meeting. In addition, the pilot Annual Equity Inclusion Report will be released to the full Board at the October Board meeting, with the goal of public input for the first complete report in mid winter. 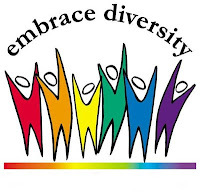 For more updates on what is happening with diversity and equity in the District, please read the superintendent's blog or the District website at www.bsdvt.org. 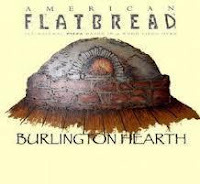 Burlington's celebration of local foods and local farms! "School Lunch for Dinner"...and a Movie! delicious local school food items. where their food comes from. Burlington School Food Project at the door. The meeting date MAY be changed as October 18th falls during Parent-Teacher conferences. Please look for that confirmation here next week. If you have ideas/experiences/frustrations to share, please attend this meeting or feel free to send an email to huntmiddleschool@gmail.com and your thoughts will be included in the discussion. Hunt Middle School Stone Circle Project. This includes both dine-in and take-out orders. Please plan to eat a globally inspired burrito at Boloco that evening, and encourage family and friends to do the same. Many thanks to Boloco for the restaurant's generosity in supporting this great project!! Work will begin on the The Stone Circle within the next two weeks!!!! If you are unable to eat at Boloco on 10/24, but want to contribute to this worthy project, please consider donating directly to the Stone Circle Project Fund. 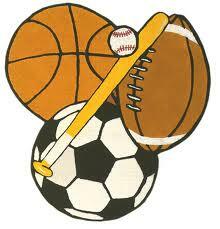 Checks should be written to the Hunt MIddle School PTO with "Stone Circle Project" in the memo line and send to the front office. Thanks in advance for your support!!!!!!!! The CCTA bus service is here for YOU! ONE Hunt families have found that that Bus 26 (arriving on North Street at approx. 7:35 am and noted in last week's blog) runs too late to get Hunt students to school on time. For this reason, Bus 26 is no longer considered a viable option for our students. Bus 35 and 32 (noted below) continue to be available. If you have questions about the Neighborhood Specials bus schedules or feedback on how the buses are running in general, please contact Mr. Amato at Hunt at 864-8469 or email him at ramato@bsdvt.org. Families with questions about the bus system can also call CCTA directly at 864-0211 as they can provide parents with guidance on which bus their students need to catch and when. Students should plan on being at the bus stop 5 minutes before the buses are scheduled to arrive. Drop off at Hunt at approx 7:22 am. Drop off at Hunt at approx 7:30 am. 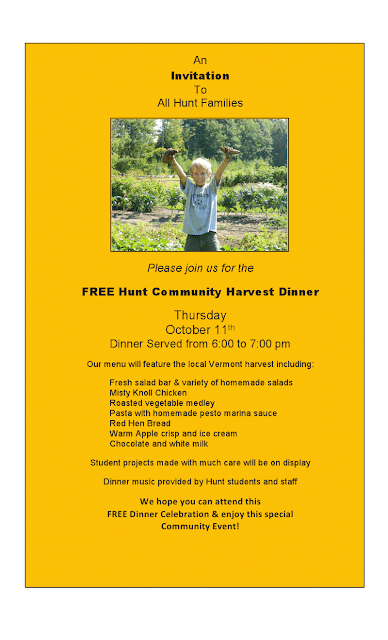 October 11 - Harvest Dinner, 6pm - All families invited!